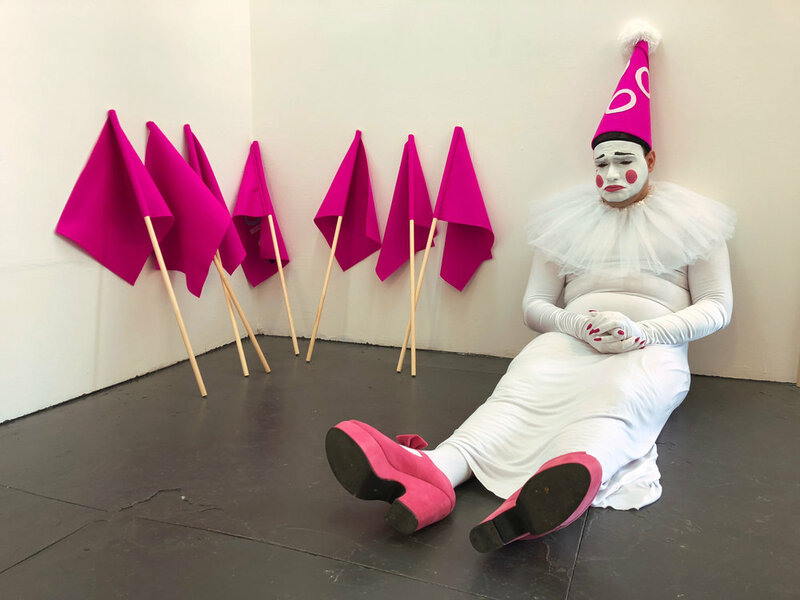 A durational live performance presented at the MFA Fine Art 2018 Degree Show, involving Queerrot instigating spontaneous partycipation with the audience members through the use of DIY props and miming. Partycipation (Noun) The act of instigating spontaneous audience participation through actions influenced by theatre, pop and queer culture. Outcast is a participatory installation devised as one of the backdrops for ‘Will you be mime?’, which uses signs associated with moments of protest and celebration which bring communities together in public spaces: Flags and Bunting. The two objects are featured in Pride Parades, as well as carnivals and fairs. These signs unify the three prominent areas of my artistic research: participation, theatre and queer culture. The audience is invited to pick these objects up and march with Queerrot, who also offers them pairs of multi-coloured gloves with acrylic nails on their tips - referencing drag culture. The moment the audience put on the gloves and pick up the props reflects how the partycipants become allies with Queerrot and the queer community. Party? is a site responsive installation which I developed following an invitation by the MFA Show Curation Team to create an artwork for the MFA corridor space. My initial response was to create bunting for the corridor, which would encompass elements from the 'Outcast' installation. Whereas ‘Outcast’ is direct with the message it carries, ‘Party?' was specifically made so that the audience would see the back of the bunting first - which only showcases the array of colours. However on a closer inspection the audience will observe that there are messages on the back of bunting - and will later discover the words spelled out, which are adjectives describing the experiences of queer people and other minorities. I feel that this slow reveal is indicative to how the heteronormative world associates the queer community with partying, glitz and glamor. However on a closer inspection the issues regarding the queer community’s position in the heteronormative world are revealed. Otherwise known as hot pink, this colour has been used by the queer community as a sign of being visible. One of the historical uses of fuchsia has been during WWII to mark homosexuals with an upside down pink triangle. The queer community has now reclaimed this symbol as sign for queer perseverance. These two colours are associated with the gender binary. However they are also the two prominent colours in the Trans Pride flag. I decided to use these colours as supplements to my colour palette, seeing as Queerrot is a non-binary character. The last colour to be added to my palette for the installation is purple: Lent from the LGBTQ+ Pride Flag, purple represents the spirit, art and creativity found in our community. Queerrot (they/them) is a queer mime who is perpetually in search of company. The inspiration behind them comes from commedia dell’arte, a genre of semi-improvised street theatre originating from 16th century Italy and in particular the character Pierrot: an innocent white-face clown who faces rejection and bullying from the rest of the troupe. Queerrot marries my passion for queer theory and culture with the lineage of Pierrot and clowning, and their adventures explicate how queer individuals who look different are marginalised from society and their own communities.